This mobile laptop trolley with gliding wheels are perfectly portable in classrooms, offices, hospitals, and other commercial environments. 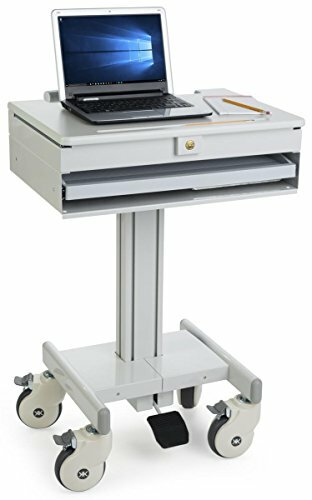 This freestanding medical cart features a pull-out keyboard tray and handy foot pedestal for adjusting the height of your technology from 35"h to 47"h. Cable management keeps the work area organized and clutter-free. The mouse pad can be attached on either the left or the right to suit left- or right-handed users. A locking drawer keeps personal items such as keys and backup thumb drives safe. This computer workstation measures 24"w x 21.5"d overall, taking up a small footprint that won't take up too much space in cramped or busy environments.